Check the annual Calgary special events calendar. Where's the fun in this rapidly growing Alberta city? It's right here in this rapidly growing Alberta city. Renowned for its mixture of Canadian politeness and Big Sky attitudes, Calgary presents a unique local culture to explore. With events ranging from science fiction and gaming conventions, to high cultural events like the Calgary Symphony, you can find your thing here somewhere. Check out a night at the opera, Harley Davidson riding tours, or the Calgary Exhibition and Stampede and rodeo. Whatever suits ya. Just visiting? Looking for something to do? keep the seasons in mind. 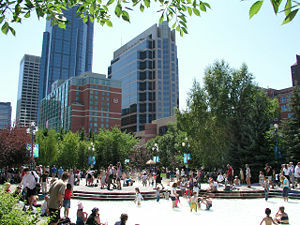 Unlike the more well-known Vancouver, Calgary actually has seasons, rather than a climate, a pea-soup climate at that. It seems pretty elementary to remember that Calgary gets to 30 below sometime nearly every winter, but there are lots of people who don't realize that it gets to the mid-30's, mid 90s for Americans, occasionally in the summer as well. Don't kid yourself, you can find plenty of outdoor things to do in Calgary. Even though inside is often preferred. Check the Calgary movie listings for instance. plenty of opportunities to volunteer and become part of the greater Calgary community. Do Calgary special events include a Winter Festival? Yes. Check the events calendar. If you're inviting friends up to Calgary, fear not the winter months. While the common perception of Calgary winter is of frozen tundra, Calgary offers a great place for sports in this season as well. Start with an annual biathlon, a reasonable drive to great downhill skiing, and excellent ice skating options. Throw in the Calgary Flames and several pro-am Calgary hockey leagues to allow you to enjoy an ice rink without strapping on the blades yourself. And contrary to popular mythology, the entire city does more than hibernate through the winter. We like to get out to see local bands just and the cold months are just as good as any. Finally, The City of Calgary puts on several public events in the winter time to get citizens out and doing things and fighting off Seasonal Affective Disorder. 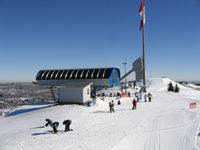 Calgary's recent growth, due to the oil-economy surge, has lead to rapid expansion of housing and entertainment options, and makes the city Canada's gateway to the west. A fascinating place to visit – or live! Calgary special events enhance that quality for sure. What did you love growing up? Good chance it had something to do with sports. Hockey. Baseball. Swimming. Maybe your greatest sports memory was last season at that Flames game. Maybe not. Anyway, if was great, it's worth telling about. Now's your chance. Got a photo for the people? Great! Click the button and find it on your computer. Then select it. Go back from Calgary Special Events to the Internet Site Map web page.